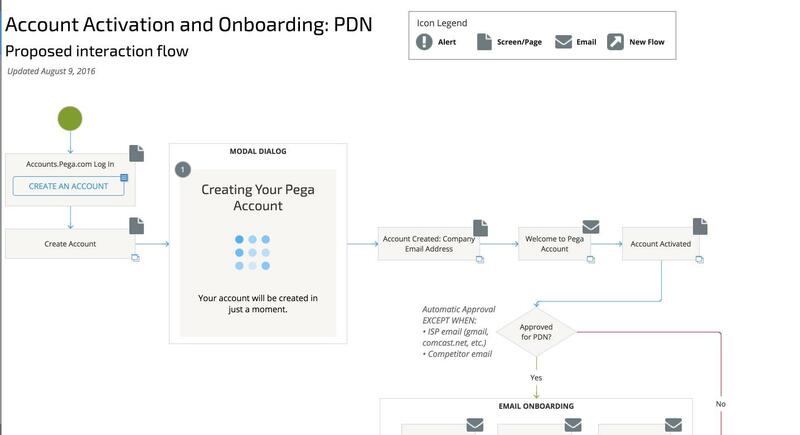 I oversaw the UX design, did early prototyping, and wrote the microcopy for a unified signon and registration across Pega digital assets. Over the course of the project, we designed screens, emails, and interaction flows for logging in, signing up, resetting passwords, and editing user information. In addition to some of the early concept/strategy work, I wrote microcopy for validation and system messaging, and wrote the copy for system emails users received during the process. The streamlined experience increased signups by 15% within the first 6 weeks after launch, and reduced account related support calls by almost 40%. 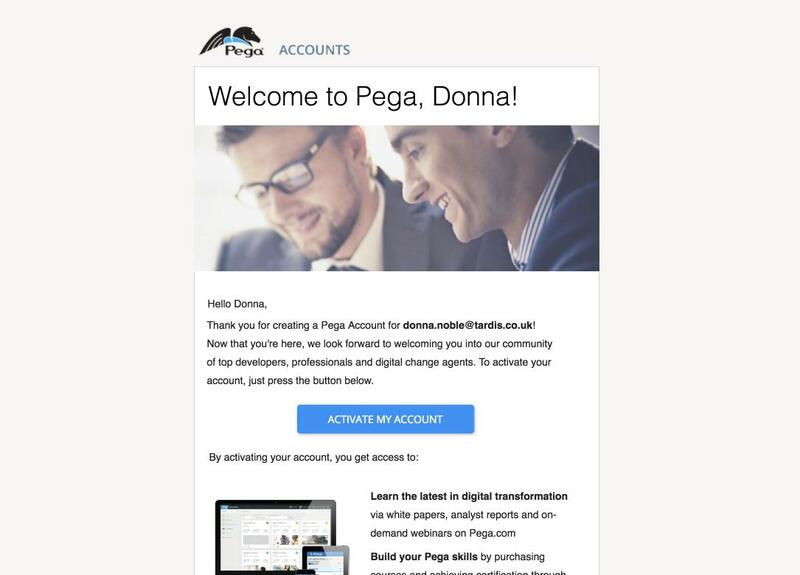 Login and registration across Pega websites was a fractured experience. Each site had its own information requirements for registration, and the technology used to create the forms created significant performance issues that led to 10s+ page loads. To increase engagement and membership across the ecosystem, we needed a unified and seamless experience. Creating a unified registration and login process took a significant cross-functional effort. While the Digital team was overseeing the work, we had to coordinate with the business owners of several different websites, executive leadership, and the teams who maintained our internal contact management databases. We started with the lowest-hanging fruit, which was a unified login process across the sites. I designed some of the early concepts for this, including both in-page and modal-based login experiences, and helped the development team see the project through to completion. I created the early workflows for activation, onboarding and signon. Building on the success of the login experience, we moved on to registration. 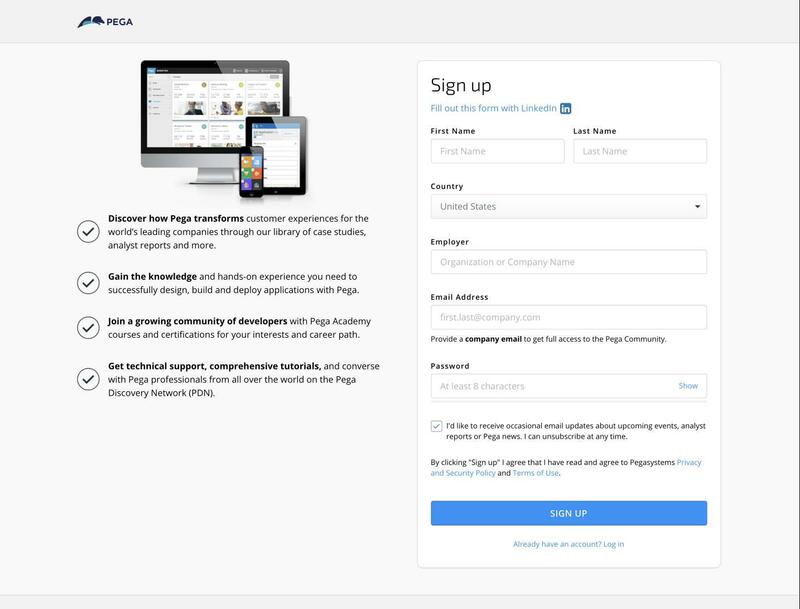 This was a harder project, as the business rules behind registration on our two flagship websites, pega.com and the Pega Discovery Network, were distinctly different. While executive leadership negotiated the rules of registration, the UX team focused on creating a simple and usable registration experience. Part of the registration process includes email notification of new account, password reset, etc. I wrote and designed these messages. The overall project was released in several phases over the course of a year, and included a "forgot password" flow, a modal-based registration flow to help with lead capture, and enhancements to the editing experience of user profiles. Worked with executive leadership and development teams to strategize and develop requirements. Created flows and early prototypes for the registration and sign in flows. Wrote microcopy for field validation, helper text and system messaging, including email notifications.